The five day Western Caribbean cruise aboard the Carnival Inspiration departing from Tampa, FL is an excellent choice for enjoying Grand Cayman Island and Cozumel, Mexico. Our first full day was at sea and the Inspiration offered more than enough opportunities for entertainment, amusement, relaxation and dining to keep us content. The Carnival Inspiration is 855 feet long and holds over 2000 passengers and a crew of 900+. It has a mini golf course, a water works park for the young at heart, and an adult-only retreat area in addition to the Lido Deck, Monte Carlo Casino, three swimming pools and the 1200 seat Paris Lounge. FOR LGBT travelers - Be sure to attend any scheduled Friends of Dorothy meetings listed in the ship calendar. This is a social meeting for gay men and a great way to meet new friends and enjoy a drink together. Our first port-of-call was Grand Cayman Island which is one of the three Cayman islands that are located south of Cuba and northwest of Jamaica. Grand Cayman Island is the largest of the Caymans which were called Las Tortugas by Christopher Columbas because of the large number of turtles there. Sir Frances Drake is credited with renaming them after the native word for alligator: caiman. The beaches on Grand Cayman are stunning and the emerald green waters are breathtakingly clear. We took a boat excursion to world-famous Stingray City to swim with the wild stingrays. It was a fantastic experience! As our boat approached the sandbar, hundreds of wild stingrays began speeding toward us. Their dark bodies could clearly be seen through the crystal-clear waters. Some of the stingrays were as large as 3-4 feet across! We were handed snorkeling equipment and sent into the warm waters, teeming with stingrays that weaved in and out and between our tour group and brushed against our legs. 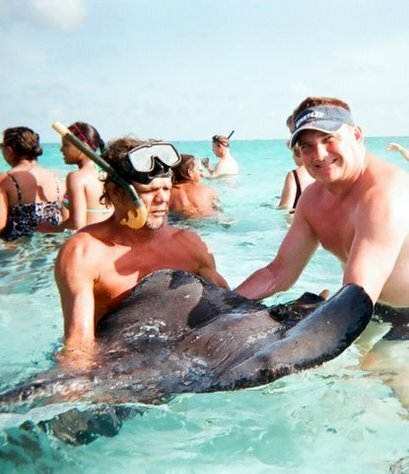 Our guides helped us pet, feed and even hold the stingrays for photo opps. This is a must-do experience for all ages! This excursion was the talk of the evening back aboard the Inspiration that night. We toured the beautiful Seven Mile Beach on our way to the Turtle Farm which produces nearly 2000 turtles a year. It is a very professional and educational environment and there are opportunities to hold the turtles yourself if you wish. Though it is a bit of a ride, it is hard to pass up a chance to send a postcard from Hell - one of Grand Cayman's most famous tourist sites where the black and grey limestone formations jut up from the ground. Local legends say that a former island governor once proclaimed, "This is what Hell must look like." There is a tiny Hell gift shop where you can purchase t-shirts, hats and souvenires from Hell and a Post Office where you can send cards and letters from Hell. After departing Grand Cayman, the Inspiration cruised to Cozumel, Mexico - an island just twelve miles off Mexico'sYucatan Peninsula and 36 miles south of Cancun. Cozumel is filled with opportunities for snorkeling and fishing and its coral reefs have been world famous since Jaques Cousteau's 1950s expeditions and exposure. We decided to enjoy an island tour so we could photograph the unique limestone formations and beaches. We toured Punta Sur on the island's southern point which houses a 247 acre ecological park which includes reefs, beaches, lagoons and a lighthouse. If you enjoy taking scenic photography, this is an excellent trip. One of the photographs we shot here became the cover of a published book. After departing Cozumel, we enjoyed another full day at sea exploring the wonders of the Carnival Inspiration and sharing stories with fellow passengers before arriving back at the Port of Tampa. The four and five day Western Caribbean cruises on the Carnival Inspiration out of the Port of Tampa provide excellent, short-term cruise vacations for all ages. Watch our video of the Carnival Inspiration 5 Day Western Caribbean Cruise below.